When a person looks at the history of the United States and for that matter the world, everything was founded and built because of adventurers and discoverers. Antarctica is still a land that has many miles that have not been stepped upon by human feet. For geological reasons, and to consider the possibilities of a defensive structure in Antarctica, men and women have been spending days and nights in this frozen land. Because of the courage and sacrifice these people have undertaken, a special medal was designed and approved to recognize these adventurers in the amazing work they are doing to move forward in understanding the planet we inhabit. In today’s post we are going to discover 8 cool facts about the Antarctica Service Medal. In doing so, you may find yourself wanting to take a trip to Antarctica, donning your parka and snowshoes, and earning your Antarctica Service Medal. 15 days or more of duty at a station in Antarctica. The days do not have to be consecutive. 30 days of duty on sea or shore that is South of latitude 60 degrees South. As of 1987, flight crews who fly 15 missions into Antarctica also are eligible to receive the award. The Byrd Antarctica Expedition Medal (1928-1930) A total of 81 people were awarded this medal. The 2nd Byrd Antarctica Expedition Medal (1933-1935) 50 people in total received this medal. The United States Antarctica Expedition Medal (1939-1960) It is unclear just how many people have been awarded this medal. It is believed there are still veterans alive who have this medal in their collection. All of these have been completely stopped from production and the Antarctica Service Medal is now the only one awarded. 3: When Was The Antarctica Service Medal Authorized, And Who Was The First Recipient? 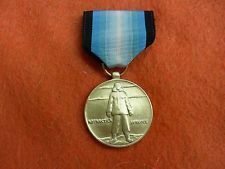 On July 7th of 1960, the United States Congress authorized the Antarctica Service Medal to be awarded to both military personnel and civilians who have performed the requirements of service on or near the continent. We are not exactly sure who received the first Antarctica Service Medal, but the first United States Antarctic Expedition Medal was presented to Admiral Richard E. Byrd. 4: The Precedence In Wear On Military Uniforms. The Antarctica Service Medal is worn before the Armed Forces Expeditionary Medal and after the Korean Service Medal. 5: Winter Clasps. If an individual spends a complete winter period in Antarctica, they will also receive a “Wintered Over” clasp. Winter months are March-October. For the first winter, the award is a bronze clasp; the second is gold, and third and any more are silver. 6: Designers Of The Antarctica Service Medal. Both the designer and the sculptor of this award were with the Institute of Heraldry. The designer was Rawson Moore and the sculptor was Thomas Hudson Jones. Working in tandem, they designed and sculpted a beautiful award. 7: The Ribbon Colors And Their Meaning. Many may look at the ribbon colors and think they are a wonderful tone without realizing the meaning behind them. The outer edges are black and represent the 5 months of darkness that Antarctica has each year. The inner portion starts at a dark blue and fades to light blue, and then white. This represents the 7 months of sun and also the Aurora Australis (Southern Lights) that is an Antarctica wonder. The design of this coin was perfect in recognizing anyone willing to take on the hard conditions of Antarctica. It would be quite an honor to hear from anyone who has been awarded the Antarctica Service Medal. It is a medal many would surely like to earn, but few ever will receive the opportunity to do so. If you or a family member have earned this award, please comment and tell us more. If you have the desire to earn this medal, you do not have to be in the military to do so. Maybe you could “hook up” with these geologists and book a trip to Antarctica. If you do make the trip, take many pictures and come back and tell us about it. I sure can’t wait to pull out this information in my next conversation. How cool will i look having such uncommon knowledge off the top of my head? Now all I have to worry about is how I will bring it up. Haha, great post!